And yet, 52 years after “I Want to Hold Your Hand” became a stateside hit and unleashed Beatlemania here, we still pony up. We’re still fascinated, with good reason. Because people like Giles Martin (son of George) and Ron Howard are still finding inventive ways to communicate the Beatles phenomenon. 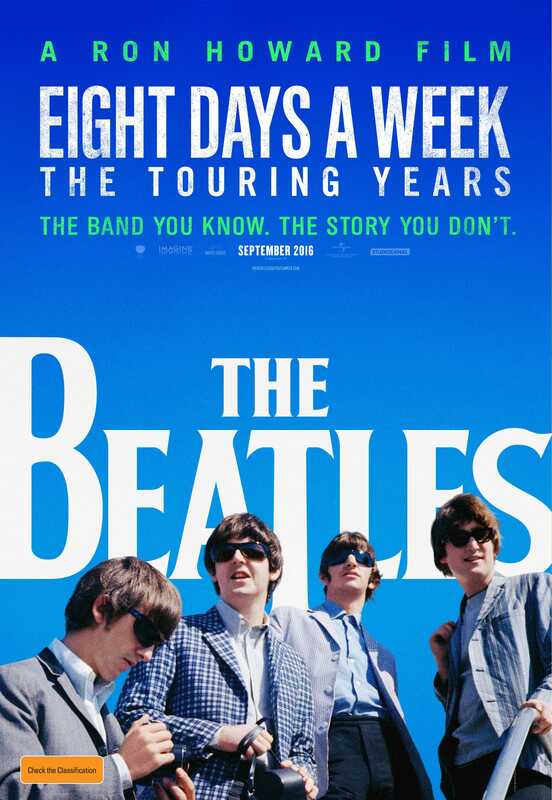 Howard’s documentary, Eight Days A Week: The Touring Years, hit theaters on Sept. 15 and premieres on Hulu Saturday, Sept. 17. Martin’s already-released companion album, The Beatles: Live at the Hollywood Bowl, released Sept. 9, is a newly remastered, remixed, expanded version of the 1977 album, The Beatles At the Hollywood Bowl. The documentary doesn’t exactly cover new ground; by focusing on that phenomenon and its historical context, it conveys that moment in time with an immediacy that still thrills. Perhaps most valuably, it puts in context not just the enormity of Beatlemania, but the impact they had on race relations in the U.S.
“It was like the whole world lit up. I felt like I could be friends with them … The Beatles gave me the idea that everybody was welcome,” Whoopi Goldberg explains, nailing the feeling those of us old enough to remember had at the time. It was a club. An inclusive club. If you weren’t in it, what was wrong with you? But it was a club black girls could join, too. And that’s a perspective many of us don’t have. Their refusal to play segregated stadiums helped change the tide of the civil rights movement. We know that, but hearing historian Dr. Kitty Oliver describe attending her first concert, by herself, at the Gator Bowl in Jacksonville, Fla., on Sept. 11, 1964, one can’t help but marvel at the true impact their stance had. Costello compares waiting for the weekly music charts to see where each Beatles song landed with sports fans breathlessly awaiting weekly team standings. Of course, Howard notes what had happened nearly two weeks before, on April 5, 1964— when the top five slots of Billboard magazine’s Hot 100 chart were occupied by one artist for the first time ever. And yet, director Richard Lester notes he was pressured to get A Hard Day’s Night into theaters by July because the studio, United Artists, thought they’d be “a spent force” by the end of that summer. Everyone, including the Beatles, thought the phenomenon would be short-lived. If she’s still alive, no doubt she still does — just like everyone else who fell in love with the Beatles back then, and still remembers. Not to mention new generations of fans who understand why that love endures: because the songs they wrote are unequalled gems, from those early moments of pop perfection to the complex innovations that followed. The clip of several tape machines rigged together to play loops is a favorite; we knew they did it, but seeing how primitive it actually was is still mind-blowing. The theatrical version also includes the Shea Stadium concert; as with all of their stadium appearances, it’s also remarkable to consider how inadequate both the staging and amplification were. And listening to the Hollywood Bowl album reinforces how much those who were there missed. Even when they couldn’t hear themselves, the band was remarkably tight because their instincts were so strong. The harmonies were in tune, Ringo Starr’s beats were right where they belonged, and McCartney, Lennon and Harrison all injected riffs that sound new even today. Their rock ‘n’ roll rawness is still unmatchable; listening to the bent notes and ragged wails of “Twist and Shout” and “Dizzy Miss Lizzy,” what girl wouldn’t swoon? “Ticket to Ride,” “Can’t Buy Me Love,” “She Loves You” … yes, they were simple, but so strong. And the ballads, like “Things We Said Today” … how could they even sing that to a sea of shrieking voices? As David Fricke notes in his wonderful album essay, the power they had over those audiences was something we still scrutinize because it still amazes us. And the excitement of discovery still endures, even after all these years.